Pepsi has announced its summer plans as part of this year’s global creative campaign, Pepsi Generations, celebrating the brand’s iconic role in music history. 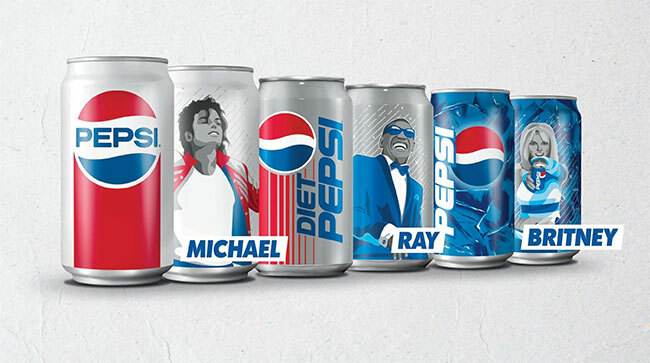 With the help of Pepsi musicians past and present, including King of Pop Michael Jackson, Ray Charles and Britney Spears, the new iteration of the campaign will continue to excite fans with a focus on music and entertainment programming, limited-edition cans, a seasonal release of Pepsi Stuff and breakthrough digital content. Through this summer celebration, Pepsi is reminding fans of all ages to unleash their youthful spirit and live life to the fullest. The world was first introduced to the Pepsi Generations campaign – a celebration of some of the brand’s biggest pop culture moments – earlier this year through the “This Is the Pepsi” national Super Bowl commercial. From supporting emerging musical talent through platforms like Pepsi Sound Drop to marquee ads featuring world-class musicians and jaw-dropping Super Bowl Half Time Show performances, Pepsi’s strong heritage in music will shine through in this phase of the global campaign, showcasing Pepsi as a force in music for decades to come. Pepsi will celebrate all summer long throughout the U.S. across the full Pepsi portfolio – Pepsi, Diet Pepsi, Pepsi Zero Sugar and Pepsi Wild Cherry. Limited-Edition Icon Cans: To honor iconic musical partnerships of Pepsi past and present, the brand is rolling out limited-edition Pepsi Generations icon cans featuring superstars Michael Jackson, Ray Charles and Britney Spears, and retro Pepsi logos from each artist’s era. The exclusive packaging will be found on regular Pepsi and Diet Pepsi for a limited time this summer and available at major retailers nationwide in 20-oz., 12-oz. can 12-packs and 24-packs. Fans can collect all three cans via multi-packs which will feature one of the three artists in each pack. Pepsi Stuff Summer Edition: Pepsi Stuff, the U.S. loyalty program that made its long-awaited return this year, is expanding its collection to feature summer-inspired retro gear and exclusive music giveaways. New Pepsi Stuff will be available starting May 14th through consumer codes found on specially-marked Pepsi packaging across regular, Diet Pepsi, Pepsi Zero Sugar and Pepsi Wild Cherry, and will include premiums such as beach coolers, grills, towels, headphones, beach chairs, t-shirts and more, as well as giveaways including the hottest concert tickets of the season such as Austin City Limits, Lollapalooza, VMAs, the Pepsi-sponsored Britney Spears tour – including meet and greets – and more.